Specialty & Rigid Casters, including unorthodox sizes, no brake and rigid plates. Base plate is 4-1/2" w/ COH to COH measuring 3-1/2" x 4" w/ COH to COH measuring 3"
Plate size 3-1/8" x 4-1/8"
Commonly used on Win Holt carts and where part is applicable. Commonly Used on Pitco Models: LJ-FBG18, LJ-FBG24, LJ-FBGD18, LJ-FBGD24, ME2, MEII, SE14, SE147, SE148X, SE14R, SE14T, SE14TR, SE14TX, SE14X, SE18, SE18R, SE18S, SE714, SEBNB14, SEBNB18, SEH50, SFSE14, SFSE14R, SFSE14T, SFSE14TR, SFSE14TX, SFSE14X, SFSE18, SFSE18R, SG14, SG14DI, SG14R, SG14RDI, SG14RS, SG14S-D, SG14T, SG14TDI, SG18, SG18DI, SG18F, SG18S, SG18S-D, SGC, SGH50, SGM1824, SGM24, SGM34, SGSEBNB-14, SGSEBNB-18 and where part is applicable. Used where part is applicable. Used on various Vulcan Hart models such as HCH16, HCH5, HCH8, HCH88, VB150, VB90, VB96, VBP13I, VBP15I, VBP5I, VBP77I, VBP7I, VCV13, VCV4, VCV5, VCV6, VHDP5, VHFA18, VHFA9, VHMD13, VHMD15, VHMD5, VHP15, VHP3, VHP7, VHP8, VP18, VRH8, VRH88 and where part is applicable. Light - medium duty casters used by business, offices, and institutions for light equipment. Recommended for manual operation on smooth surfaces. Complete Caster Unit includes assembled wheel and rig. Light - medium duty casters, up to 600 lb. (272 kg), are used by business, offices, and institutions for light equipment. Light - medium duty casters are used by business, offices, and institutions for light equipment. Heavy duty casters used for commercial and industrial applications. Operated manually or by intermit tent power under 3 mph. 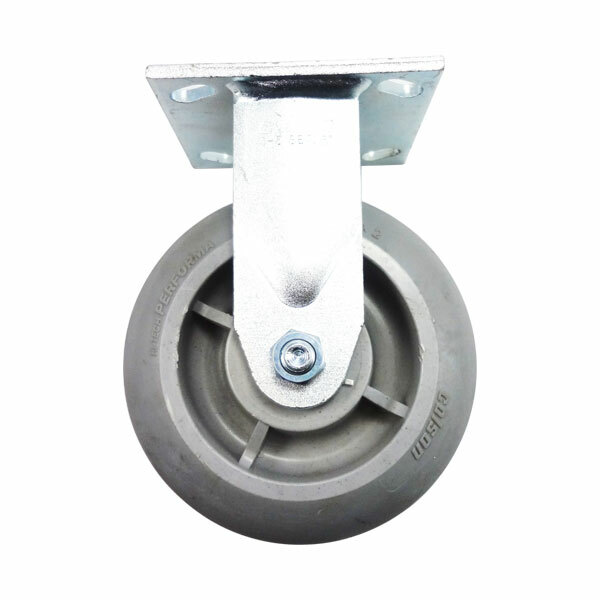 Heavy duty casters are used for commercial and industrial applications. They are operated manually or by intermit tent power under 3 mph. Hole spacing 1 3/4" x 2 1/8" x 3 3/8"
Plate size 3 1/8" x 4 1/8"
Rigid plate caster 6" x 2"